Atlanta has been quite the experience for me. This is where I fell in love with men's fashion and began pursuing men's fashion's illustrative avenue. It began with the suggestive word of a friend (Mike McLaughlin- commencefailure) and a gift card from HomeGoods. Street Style had already taken root in popular culture and I was yet unaware of it. Polos that draped my body like a Roman Toga and Khakis that barely stayed resting upon my hips were the height of my fashionable endeavors. With my gift-card and passion in tow I purchased some Khaki Chinos and a casual Calvin Klein, blue-tartan, button up shirt. I knew it! I knew that this would make me the hippest kid in town. The coolest cat in Atlanta. Catlanta didn't know what was heading its way… or not. This first attempt at fashion glory was pale in the light of folks found across the entire internet spectrum, foolish perhaps. Lucky for me my laptop had been stolen my first night in Atlanta and I hadn't yet gathered the funds to enter the world of the informed- whether that be about fashion or about the world as a whole. Nevermind my failures in the beginning, the first step was still glorious even if it was only for me. It would still be another two years before that me became this me. Before the chino wearing, bright-eyed passion began thinking of illustrating fashion. Before the act of illustrating was truly a pursuit. That first step was brilliant and beautiful. To purchase this 3x5" index card watercolor illustration click here. And if you wanted a booklet and didn't get the luck of it you can purchase one for $5 at the Sunflowerman Shop on Etsy. There are 10 Men's Fashion Synopsis Booklets that are waiting for a home and they want to go home with you. The best part is that you can get one for free. Just share this post via your preferred social network (Facebook, Twitter, Tumblr, Wordpress, Instagram) and tag #Sunflowerman to be entered into a drawing to win one of the ten free Men's Fashion Synopsis Booklets. Deadline is Friday, March 8. Each Booklet is hand-bound and comes with a little surprise inside. 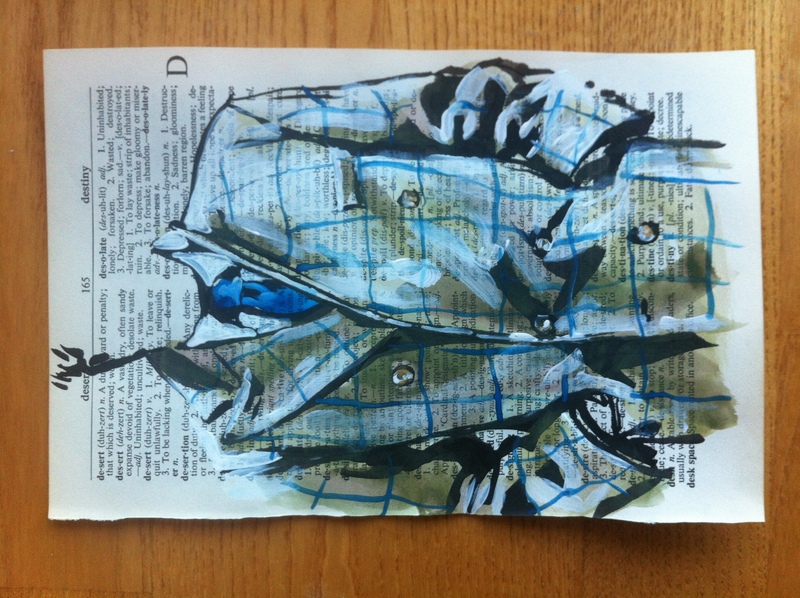 As a result of being a men's fashion illustrator I find myself delving into the history of men's fashion. I like to know where history can be painted in to each illustration. The styling has been variable over the past century and half or so. When Beau Brummel (the man often credited with inventing the modern suit) decided to wear the first hipster pants in the 1800's he was just trying to be different and unique. Who knew that he would start a revolution? It did help that in the 1600's King Charles the II made a royal change to the dress code of the court. They were to no longer wear the opulent French uniform, but switch to English cuts and fabrics. Politics and environment heavily influenced the change which prepared the way for Brummel. I often wonder at the oddity of lapels and collars, the need to secure a noose around the neck of the shirt and the overall lack of color in men's clothing. Where does the desire for retaining vestigial patterns in clothing come from? The most odd thing about it is that I love it! I truly do love it. I love beautifully cut jackets with a perfectly complimenting shirt. I love ties in all of their absurdity and the craft of a well made pair of shoes. The joy is confusing. All of the descriptions are particularly arbitrary; 'beautifully cut,' 'perfectly complimenting,' and 'well made.' It must partially be contributed to the suits' symbol of power, but I like to think that it also says something about our past. In the same way an aged wine is born with decades of knowledge and passion I see the modern suit as a sip of Domaine de la Romanee-Conti. So I continue to illustrate. 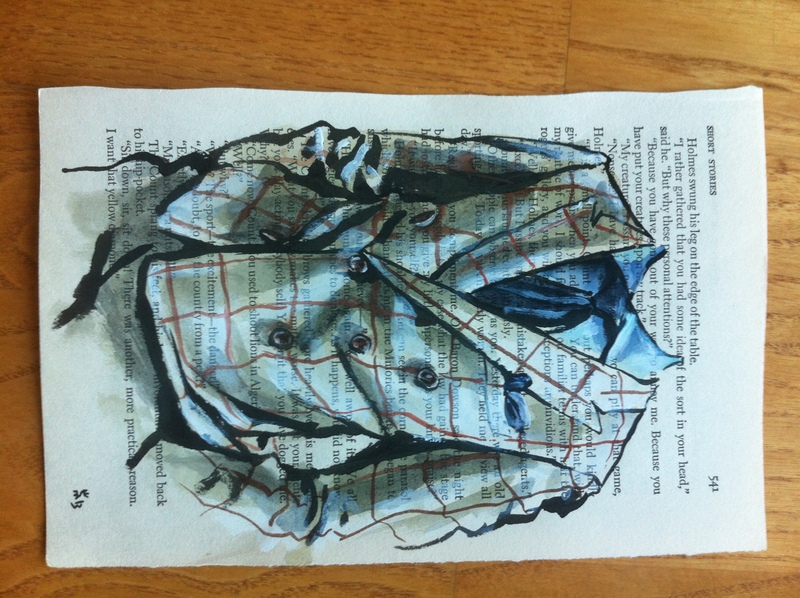 I continue to paint and create and iterate in the fashion of the bespoke tailors in Savile Row. I see and feel the beauty of men's clothing and fashion and I am excited to participate with everyone in wearing and exhibiting men's fashion. Here is a visual insight into the process of one of the men's fashion illustrations. Not everything is revealed, but study the images and you will get the gist of it all goes down. Let me know what you think. This men's fashion illustration is a part of the Illustration Weekly Series and was featuring the Milan's Men Fashion Week at the beginning of 2013. A friend of mine is intensely interested in Harris Tweed. He has visited the islands where it is made, talked with the mill owners and sees an opportunity to invest in a Harris Tweed rebirth. 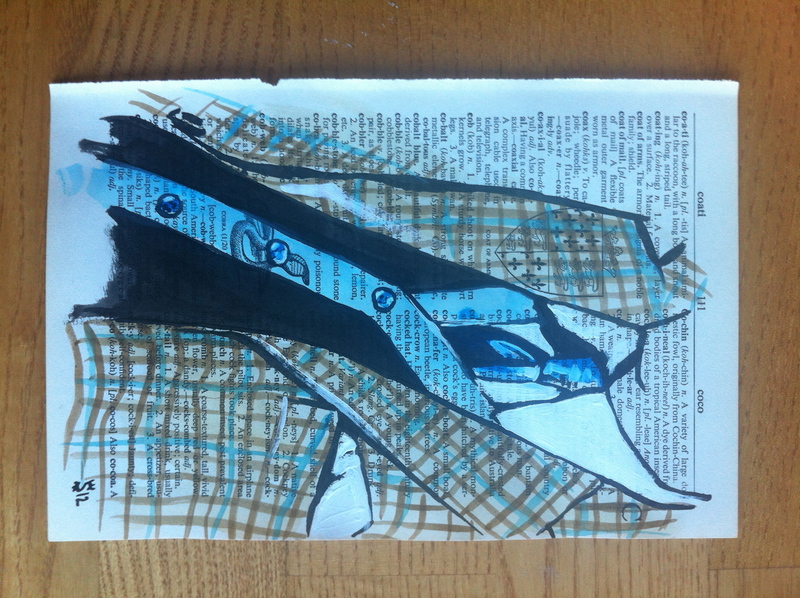 His interest has peeked my own and has caused a heavy influence of Tweed in many of my illustrations. A big question though, is Harris Tweed viable in the 21st Century? All of the tweed is made on a specific set of islands in the Outer Hebrides of Scotland. All of the tweed is home spun and can be made no other way. Parliament even enacted legislation to protect Harris Tweed from being produced anywhere else with any other standards than how it is produced in the Outer Hebrides. A special Orb is attached to all approved Harris Tweed to guarantee authenticity. The islands' economies are almost exclusively based on the production and sale of this special wool. With most fashion labels producing ready made clothing in large factories at ever cheaper prices the cost of doing business in the Outer Hebrides is high. Businesses are purchasing less of the heavy weight wool and expensive artisan craftsmanship to produce their items at the lowest and cheapest costs. Is anyone interested in wool fabrics for leisure in the spring and summer? Is there a demand for high quality and intricate craftsmanship? I was 11 with hair trimmers in hand. My mother vehemently and vocally disagreed. The masterpiece she had been parting over the last 10 years was disappearing. The full, soft, curvaceous mop atop my head was now adorning the tile beneath my feet. Freedom. The tyranny was over. No person could control me any longer. My idols-a disobedient cousin, my father who liked to cause little mischeifs, the athletes on the playground- were now all knowable. I could truly understand them for the first time. I could feel the power. I cut off all my hair. I was 17 with a paint brush in hand. The classroom bustle had lulled and all of the students were balanced upon their stools. My bristle top stood attentive as it had for the last 6 years, standing guard. This particular day it was given a new permission. Change. The need for military grade hair-styling disappeared. The girls in the class expressed in resolute terms the attractiveness of long hair on men. Within 6 months I was a new man. My posture strong, my eyes seductive and my hair fell to the length of my shoulders. Since those Sophomore grade-school years the cuts, lengths and styles have varied dramatically. I have grown it to obscene lengths and cut it back to nothing again. I have shocked my friends with dyes, straightening, gelling, mohawks, near-mullets, corn-rows and at times a sheer lack of concern. Some members of my church even went so far as to scorn me for my erotically long hair. The adventure of hair is fantastic if not at times controversial. If God gifts you with a full head of hair do not waste it. Enjoy it. Revel in it. Let the world see and marvel at it. I have been wanting to share something special here for a while. This is the first of several templates I will be releasing here at the Sunflowerman Blog. Please feel free to utilize these (png's) as you wish. Share with a friend. Street Etiquette- Travis Gumbs and Joshua Kissi. These two kings of fashion will never let you forget to pay close mind to the styles on the street. I am excited to share this six spot progression of my latest Men's Fashion Book Page Illustration. The unfortunate aspect is that I had to rush and I couldn't scan the steps, but thank goodness for my iPhone. Another day saved by the amazing technologies at hand. Take a good look if you are able, at the process here. There is no pencil drawing as guide for this illustration. I went straight onto this page from 'The Birth of Western Civilization' by McGraw Hill, using an ink well and a round brush. 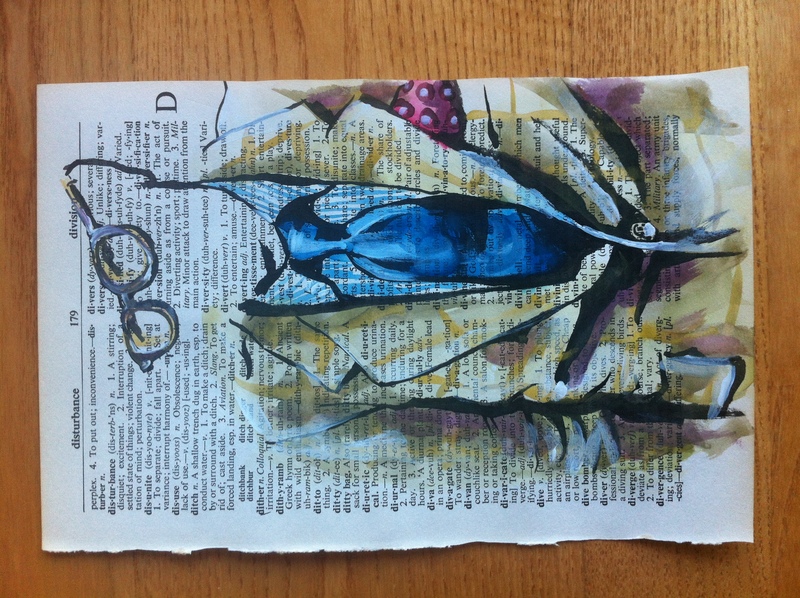 This Men's Fashion Illustration is being donated to Art Papers, located in Atlanta, GA. A friend told me about the opportunity to network with over 250 other artist and numerous art collectors and there is no reason to pass up an opportunity of that nature. I still know little about the organization that is benefiting from this amazing donation. It is true! The rumors, or lack of rumors suggesting the collaboration between Sunflowerman and Sam Flax Atlanta can now be confirmed. The 'Watercolor for Illustrators' shorts series will be released for free in a couple weeks. I have had the immense pleasure to partner with Sam Flax in presenting this information, free of charge to anyone and everyone. Here is a video from the last Sunflowerman, Sam Flax experience. Now take one home by visiting the shop. Jahmal, from Bowyer and Fletcher contacted me about some Bow Tie artwork for their fine bow tie brand. Bowyer and Fletcher was an early subscriber to the work I have been producing with men's fashion illustration and their support bolstered my confidence entering into this new market. The brand has now grown beyond just bow ties (see the new product) and I am excited to see where else they can expand in the future. I have to say that with this project took some long time to produce anything. I stake claim to the blame for that. Local projects kept finding there way into my days and I neglected the good folks at Bowyer and Fletcher. The wait did allow for the development of a project that had been floating around in my mind for some time. If you recall the large fabric paintings from the H. Stockton show (in case you missed it) you will know what I am talking about. There, I debuted the large fabric fashion paintings. The reactions were all ecstatic and I knew that along with my overwhelming joy for there creation that this is what I needed to do with Bowyer and Fletcher. I am a little disappointed that there is little visual comparison of size but if you are a technical person then knowing that it is approximately 6 feet by 2.5 feet will suffice. Grommets are placed in each corner of the fabric for easy stretching or displaying on walls or in windows or over hand made frames. Now go check out the good work from our friends at Bowyer and Fletcher. And see the featured Bow Tie. High Cotton is a new, local North Carolina high fashion attire company. James, one of the spokesmen (and son of the artisan who hand sews the bow ties) contacted me a while back about a possible collaboration for the brand. High Cotton makes amazing hand sewn, 100% cotton bow ties and cummerbunds. I particularly have my eye on the corduroy. When I tell you that James is one of the most passionate and genuine salesmen I have ever met I am telling you that I look forward to every phone conversation. One time his mother even joined in on a call. High Cotton to me has been the hospitality of the South and the sincere ambition of creating beautiful things. You will find this following phrase on their website and it captures High Cotton for me. We have a lot of plans in the works that make me giddy but I couldn't help but to share what has been produced to this point. We are focusing initially on the large Fashion Fabric Paintings (like the ones from the H.Stockton show) and some smaller book page illustrations.